For president-elect Donald Trump, “Happy Holidays” is apparently nothing more than politically correct nonsense. For many conservatives, the phrase is just another example of the “war on Christmas” perpetrated by liberals. Trump’s attitude may be a welcome change for the evangelicals who helped him win the GOP primary and capture the White House. Trump won 81 percent of evangelicals, according to exit polls — more than Romney in 2012 or even Bush in 2004. 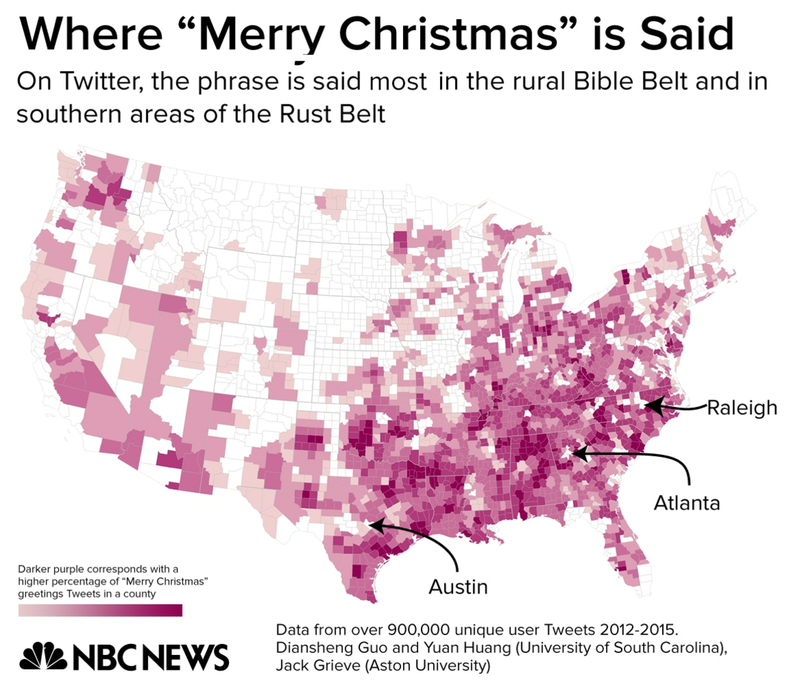 An analysis of four years of Twitter data — more than 400 million tweets — by NBC News with linguistic and geography researchers from the University of South Carolina and Aston University found that “Merry Christmas” usage is commonly found in areas that were key to Trump’s primary and general election wins. So why does Trump continue to claim “Merry Christmas” is waning in popularity? While Twitter is not a perfect sample — only about 21 percent of adults use it and it skews younger and more urban, according to The Pew Research Center — it is considered one of the best ways to understand language use in real-time. One simple reason Trump champions “Merry Christmas” is because it appeals to key parts of his base.